Newcomers and summery, fresh-tasting, hoppy beers helped to keep interest alive for the ninth annual Albuquerque Hopfest. Each year the crowds get larger, and each year I wonder how in the world Marne Gaston puts on such a large production. But, she does, flawlessly, and I am in complete awe of her. I would be a quivering puddle of goo. But, Marne is the calm in the eye of a hurricane (there is currently a Hurricane Gaston in the Atlantic that reformed on the day of Hopfest; I can’t even make this stuff up). Our heartfelt thanks, once again, to Marne and her staff and volunteers for another fantastic event. As always, it was “so many beers, so little time,” so for me it was all about being selective. I focused on mostly local beers I have not tried and those that are not readily available at taprooms. A few of those beers stood out, and some were big surprises. Enchanted Circle made a positive debut at Hopfest. Even before the doors opened, a musician friend of mine who was setting up to play on one of the outdoor stages told me, “You have got to try the Enchanted Circle ESB if you like malty beers.” Well, yes, I do, and yes, I did! It really was very good. In fact, I thought in general the Enchanted Circle beers out of Angle Fire were one of the two biggest surprise hits of Hopfest. Even though IPAs are not my favorite, I was extremely impressed with their IPA (7.3% ABV). For such a new brewery, they have really done well with a solid beer to please the West Coast-style IPA lover. I also want to thank them for actually displaying the stats (O.G., IBU, and ABV) as well as the names. Not too many did, and I wish more of the breweries would have. 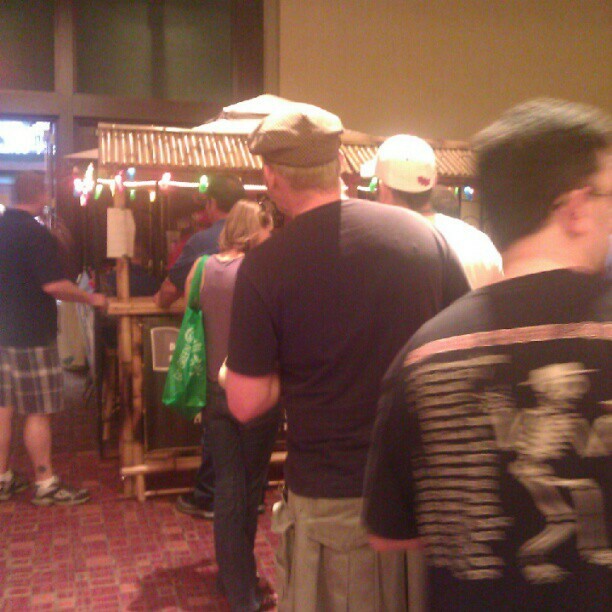 The Dukes of Ale booth was a big hit again. The second big surprise (based on consensus among my group of four attendees; one of whom is very much a hophead) was not an IPA. It didn’t come from a big name. Heck, it wasn’t even from a local brewery. It was the German Hefeweisen from the Dukes of Ale Homebrew Club. Other favorites included Quarter Celtic’s McLomas Dry Stout and #GFF (Grapefruit Forever) IPA, Ponderosa’s Wry Ale, and Red Door’s Nieuwe Bruin. Albuquerque Brewing Company’s Dunkleweisen did not disappoint. It’s one of their semi-regular beers, but it seems it is always out when I stop by. It was wonderful to be able to finally taste it on Saturday. Surprisingly, I quite enjoyed the Green Chile Pilsner from Bathtub Row, because I don’t usually care much for pilsners or chile beers. This one was an outstanding version. The Quarter Celtic staff left everyone else smiling, too, with their new stout. 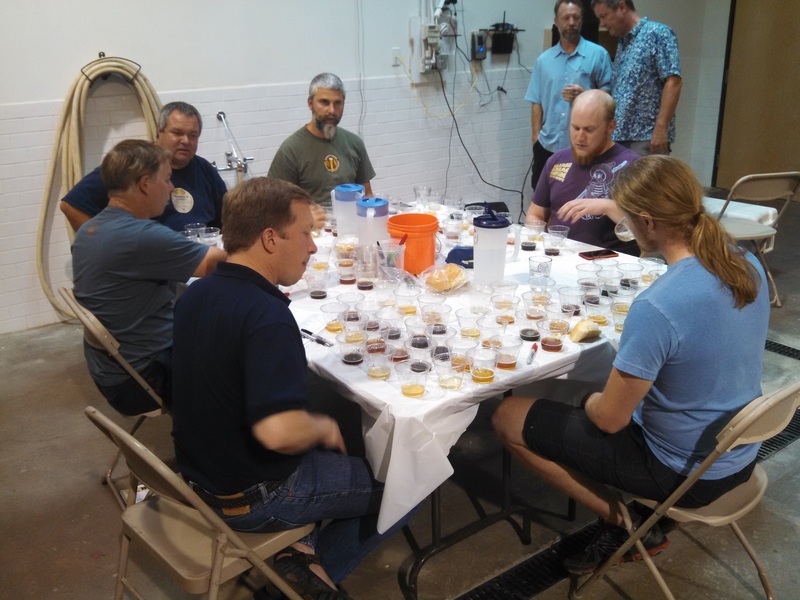 Since I was unable to attend the New Mexico Brewers Guild Sensory Analysis Seminar presented by Craft King Consulting, LLC, the Crew would welcome and appreciate any feedback on that portion of the event from our readers. The VIP beer list was quite impressive. I tried a few, but not all, of the beers in the VIP room. Mother Road’s Coffee Lost Highway, Founders’ Devil Dancer Triple IPA, and Sierra Nevada’s Narwahl Imperial Stout were my favorites. I didn’t attend the VIP pouring of Hop Pact from BJ’s Brewhouse because there was also a limited supply out in the main room, and I had it on Monday night at a Green Flash beer dinner at BJ’s. Hopefully many attendees were able to sample this fantastic collaboration beer between BJ’s Brewhouse and Green Flash. It is completely unique and refreshing, with more subtle hops, crazy amounts of floral notes, and the ability to cleanse your palate. Speaking of palates, near the end I was suffering major palate fatigue. I started to slow down just as the rain chased the outdoor flock into the already crowded main room. At about 5:40 p.m., we gathered our swag (why do I keep collecting so many pint glasses? I could pretty much open a store at this point) and headed for the shuttle to the Railrunner, awash with post-festival beer glow. 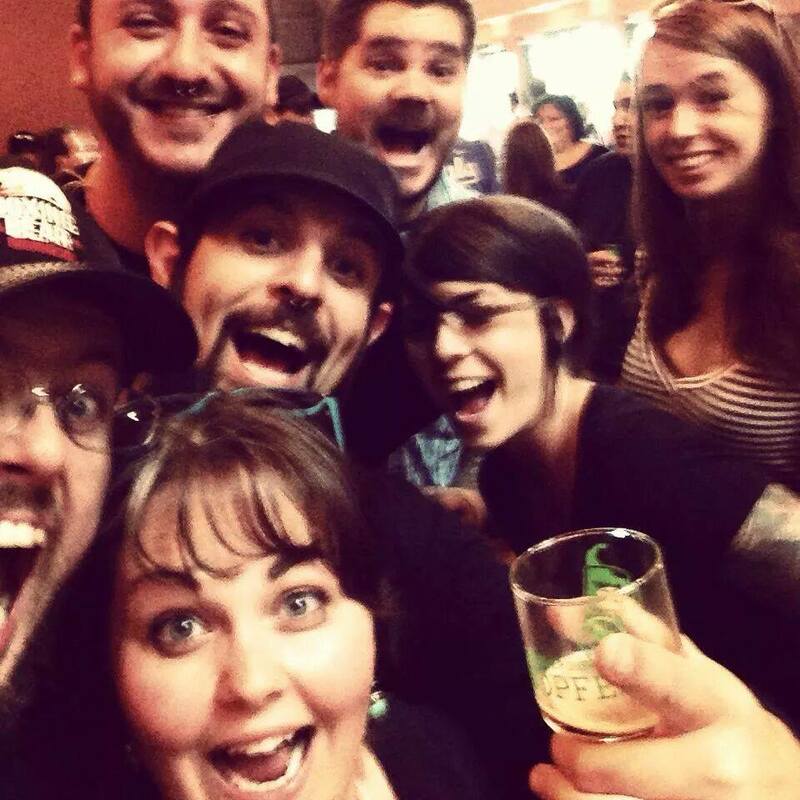 We cannot guarantee your level of Hopfest shenanigans will approach ours, but you can try. The Albuquerque Hopfest returns this weekend, featuring 70 breweries and a whole lotta beers down at the Isleta Casino. Once again, the Crew will be in attendance, as we are veterans of this annual event. So we present our picks for what beers to try and all the other advice we can think of sharing. First up, if you do not have your tickets yet, click here and buy them. Pay extra for the Extra Hoppy Hour, which starts at 2 p.m. instead of 3. Trust us, it is worth it. You get those 60 bonus minutes to try your beers with short lines everywhere. So peg your favorites, see where they are on the map, and chart out a plan of attack. In general, we hit the side room first (west side of the main hallway), then the main ballroom, and finally outside. While outdoor beer festivals are fun sometimes, the blazing heat plus dehydrating alcohol can be a bit much. Plan your time outside accordingly. It might be wise to go there earlier rather than later. Take this note about the outside setup, it is a bit different this year. As event organizer Marne Gaston explained, they have moved out of that little courtyard area on the southwest corner of the building. That area will still have some tables and chairs in the shade for folks to enjoy, plus a grill serving up some tasty food, but the brewery tents are no out in the parking lot. As this is now the Xtreme Hopfest, that is also where the BMX stunt area will be, which is good because we were afraid they would be peeling riders off the walls if they set up the stage in the courtyard. Backing up a little bit, we highly recommend folks take the Rail Runner down to Isleta (the train leaves downtown at 12:12 p.m.). There will be shuttles at the stop to take you up the hill to the casino/hotel complex. This is unless you have a designated driver, which can be good since the train out of Isleta leaves at 6:10 p.m., so you will have to clear out of the Hopfest area before the event officially ends at 6. Otherwise the next train leaves there at 8:15 p.m. There is also the VIP area, which is in the room on the south end of the main hall. If you paid extra for that, you will be happy to know that Whole Foods will be providing food pairings to go with the available beers. We did not get a whole list of the pairings, but we do have the beer list and times they will be poured by the awesome Monica Mondragon and her staff of volunteers. As for the beers for us non-VIPs, once again, we’ve broken it down so you don’t have to. Just remember that these picks are coming from a bunch of people who like dark beers and big-flavored hoppy beers. In the interest of time and space, we are skipping the cideries and hard liquor establishments. Please take note that will Distillery 365 does make their own beer, they are only bringing their vodka and rum to Hopfest. Also, Boese Brothers was a late scratch as they did not have enough people to staff Hopfest and their brewery. Just one of those weekends, we suppose. We broke this down alphabetically by geography. Adelbert’s: This Austin, Texas-based brewery specializes in Belgian-style ales, though they did not give us a list. We’ll have to see what they bring. Big Sky: No list available, but they usually bring good stuff. Marble: In a shocker, we did not get a list from Marble. They like to surprise us. Yeah, that’s it. Upslope: They’re only listed as bringing their IPA and Thai Style White IPA. We hope there’s more, but those are pretty decent. Dukes of Ale: The home brewers’ booth is always worth a visit. We have heard there will be a pilsner, wheat, hoppy red, and some ciders/meads available. Vote for your favorite. Other breweries in the room: Boston Beer Co. (Samuel Adams), Goose Island, Kellys, Kona, Omission, Radeberger, Pyramid, Third Shift, Traveler, Widmer Bros. Remember, all beer lists are subject to change, so we could all be in for some surprises. See you all at Isleta. Brewer vs. brewer on TV sounds a lot better than another show about cooking. Or pawn shops. Or rednecks. Cooking competition shows are already wildly popular. Everyone loves a good battle in the kitchen because that’s how you really see how something is made and all the blood, sweat, and tears unwritten into each recipe. Whether it’s over cupcakes, foie gras, or baby back ribs, it’s fun to watch real people compete with real passion and creative ideas, all the while producing something we’d actually consume. It sure beats watching people starve on an island. Ahem. Paul: Head to Head is a (respectful) competition show that has home brewers and pro brewers making beer under the same set of constraints. The beers will be judged by trained judges and then sampled with a live audience. DSBC: Who came up with the idea for Head to Head? Paul: I had the original idea and brainstormed with other beer lovers. The team at New Mexico Film Resource (NMFR) then helped me refine it. DSBC: How did you come up with the idea? Paul: There were a couple of things. In addition to brewing , both my wife and I do a lot of cooking so we watch cooking shows including “Top Chef” and some of the other shows. I was disappointed in both “Brew Masters” and “Brew Dogs.” One night, I was channel surfing and saw a show called “Airplane Repo.” I figured if there was a market for a show about people getting their airplanes repossessed, there’s got to be a bigger market for craft beer! DSBC: I have to agree with you on that one. What features will the shows include? DSBC: What sets this show apart from other competition shows or beer shows? Paul: One, the host will not be swearing and screaming at the brewers! Giving them the time needed to brew a beer. The way the show is shot will be unique, but I can’t say too much more than that just yet. “Brew Dogs” is about beer, but it’s not the same vibe we think is needed for “Head to Head.” Our hope is to have each season in a great beer town including Portland, San Diego, Raleigh, etc. (not just a new city each episode as in Brew Dogs). DSBC: Who is your target audience? Paul: The audience is anyone that loves craft beer, and there are a lot of them. The demographics are very wide. Craft Beer grew at 18 percent last year, and over 1,000,000 people brewed at least batch of beer last year! Brewing as a competition. How novel. DSBC: That would definitely include the Brew Crew. Where will the show be shooting? Paul: We want to shoot the pilot here in New Mexico. Where the episodes are shot depends on who picks up the show. My hope would be to do season one here. DSBC: Who will be involved with filming/production? DSBC: That makes sense. So, to which channels do you plan to pitch the idea? Paul: I would want to start with the usual suspects, Esquire, Spike, Food Network, Discovery, National Geographic, etc. But I’ll talk to anyone who will listen to me! DSBC: I think there is definitely a market for this kind of show. So, Paul, how are you going about getting this ambitious project off the ground? Paul: I contracted with NMFR to shoot the promo video with my own money. They have done a number of crowd-funded projects already. DSBC: Why did you choose Indiegogo over say, Kickstarter? Paul: Because I’m using NMFR and they are a non-profit. If we reach our goal, Indiegogo will not take as large a percentage leaving more money to get the pilot done. Kickstarter tends to be an all or nothing proposition, whereas even if we don’t hit our full goal, we might have enough to start. DSBC: How can craft beer lovers help get this show on TV? Paul: The Indiegogo page is here. We will also be at Hopfest on Saturday at Isleta. We have a number of contribution perks. If anyone wants something different, please contact me. DSBC: When is the deadline to donate or sponsor? Paul: The campaign runs through Oct. 16, 2014. DSBC: Paul, is there anything else you’d like to add? Paul: I want to thank the people who have contributed time and money to this already. New Mexico is a beer mecca as well as having the film and TV resources to make a professional show. We have some great brewers and breweries here and I would like to show them off to the world! Special thanks again to Ken and Kaylynn at Nexus for their help with the promo video. DSBC: Thanks Paul! Looking forward to watching Head to Head soon, pint-in-hand. It all started here on Saturday at Santa Fe Brewing. Luke and I were able to attend the American Homebrewers Association Rally held this past Saturday. 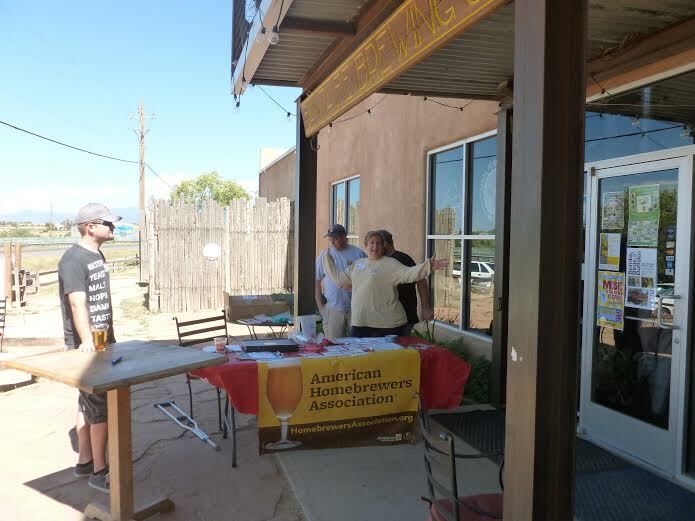 The event was hosted at Santa Fe Brewing by Alana and her crew as well as volunteers from the Atom Mashers, Dukes of Ale, Santa Fe Home Brew Club, and Sangre De Cristo Craft Brewers club. The event was open to members of AHA and renewals and signups were offered at a discount that included reduced dues, raffle tickets for books and swag, and two free beers. The Mother Road Mobile Canning line in action. Also in attendance was Mother Road Mobile Canning, who gratefully offered free canning to home brewers who brought their finished beer to the event. 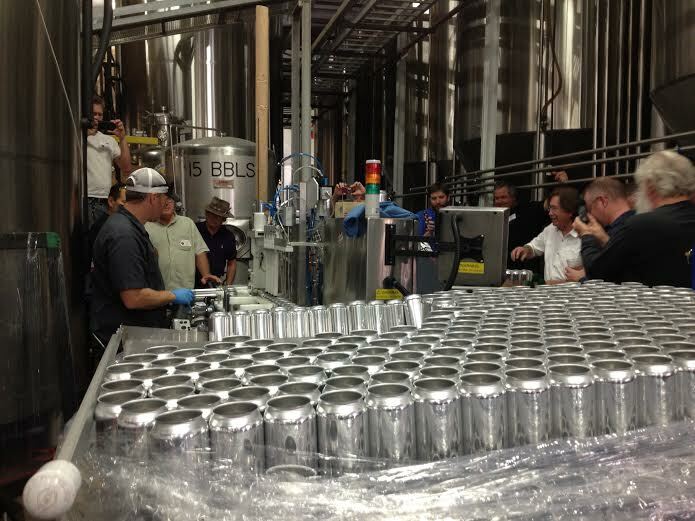 After some excitement about finding a proper electrical source for the equipment, multiple brewers were able to get their creations inserted in to 12-ounce shiny cans. There were a lot of smiling faces carrying out cases of their fine beers. This was a great event and a good chance to meet old friends and fellow brewers. As always, Santa Fe Brewing were outstanding and gracious hosts providing space and hospitality for the event. Thanks to all the hosts and volunteers in putting on such a great event! What’s up guys? 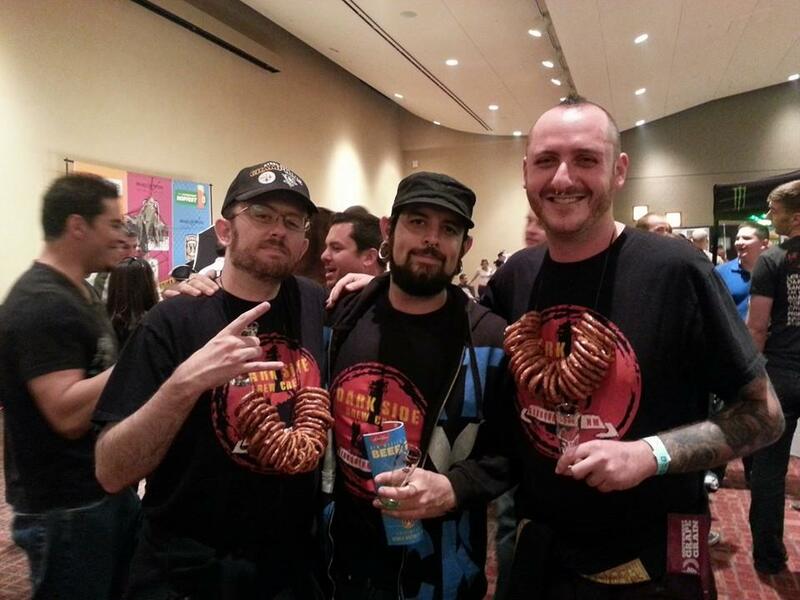 Luke here, with my bit on the American Homebrewers Association Rally. For my portion of the article, I had the great pleasure of talking with just about everyone that attended, from the always friendly Santa Fe Brewing Co. staff, and Mother Road Mobile Canning’s crack team, to other Santa Fe brewers who stopped by, incognito, whose cover I won’t now blow. 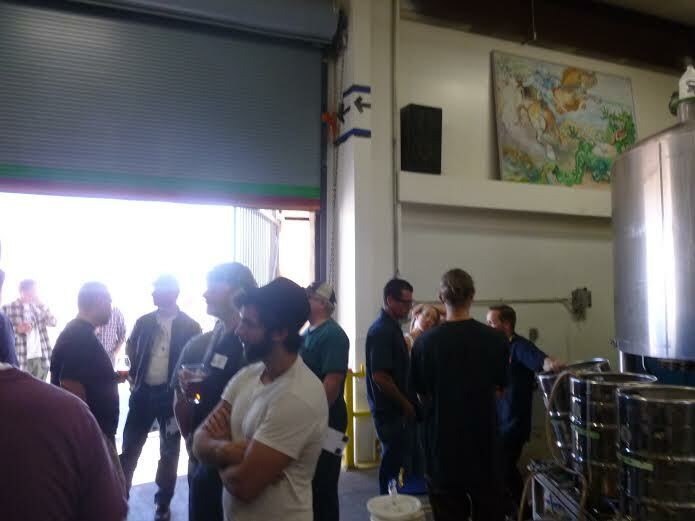 There was a great turnout from all corners of the beer community, but most importantly that day, I got to chat with the heart and soul of the AHA organization, the homebrewers. A ton of you guys and gals came out, from all over the state and the surrounding areas including Arizona, Colorado, and Texas, but I figured I’d only pester a handful of you with some very brief interviews, to see what New Mexico was brewing at home. DSBC: What’s your name and where are you from? Mike: My name’s Mike and I’m from, Santa Fe, NM. DSBC: How long have you been homebrewing? Mike: Been brewing since 2001, so 13 years now. DSBC: What got you started? Mike: An infomercial on the TV Guide Channel. The Homebrew Store had a commercial and we thought, why aren’t we doing this? And we immediately went out to the homebrew store and bought supplies. DSBC: What are your favorite styles to brew? Mike: Anything hoppy. I like brewing hoppy beers, although lately I’ve been brewing less hoppy beers, just for the change, to try and diversify my brewing. But black IPAs are my favorite style to brew. DSBC: We’ll have to talk about that black IPA later. For now, last question. What’s in the fermenter? Mike: Right now I have a stout, an amber, a Belgian specialty ale, and a rye hybrid. 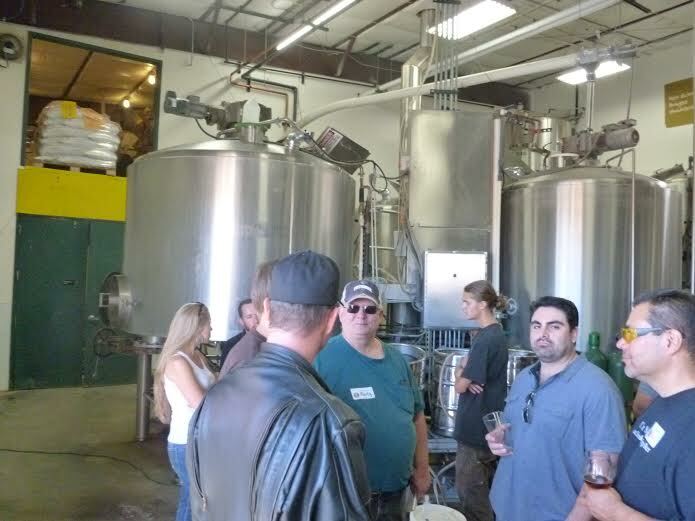 A meeting of the beer minds inside SFBC. DSBC: Hi, what’s your name and where are you from? Blair: My name’s Blair, and I’m from Taos. Blair: Three or four years. DSBC: Cool, and what got you started? Blair: It was kinda something I wanted to do for a long time. I’ve always been into fermentation in general. DSBC: What are your favorite styles to brew? Not an easy question, I know. Blair: I like to try new things, but I’m consistently drawn to brewing Belgian styles. I probably drink a lot of hoppier IPA-type things. DSBC: Same here! And last one, what’s in the fermenter? Blair: Well, a session IPA and a cider. DSBC: A cider, interesting! We see a lot more people brewing ciders these days. How’s it going for you? Blair: Well, I kinda feel like that was my first attempt, and I have a long way to go. Move toward the light, beer lovers! DSBC: OK, just a few simple questions. What’s your name and where ya from? Eric: I’m Eric, from Santa Fe. DSBC: Nice to meet you, Eric from Santa Fe. How long have you been homebrewing? Eric: On and off for 20 years. Eric: I just like better beer. DSBC: Great answer! What are your favorite styles to brew? DSBC: And lastly, what’s in the fermenter right now? Eric: Nothing right now! But there will be soon, an Oktoberfest. DSBC: Tis the season, cheers Eric! Edward: Edward Otero. I’m originally from Los Lunas. Edward: I got outta college, well when I was in college, I loved beer. When I got out, I could afford it, and I wanted to brew my own stuff. Edward: Light lagers and stouts. DSBC: So, both ends of the spectrum, nice! What’s in the fermenter at the moment? Edward: I got an American Lager and a Bohemian Lager. Admiring the fermenters and bright tanks. DSBC: Very cool! Appreciate your time, Edward. DSBC: Hello, what’s your name and where are you from? Angie: Angie, originally from Oregon, now Santa Fe. Angie: A year, this last weekend. DSBC: So what got you started brewing, Angie? Angie: My boyfriend introduced me to beer. 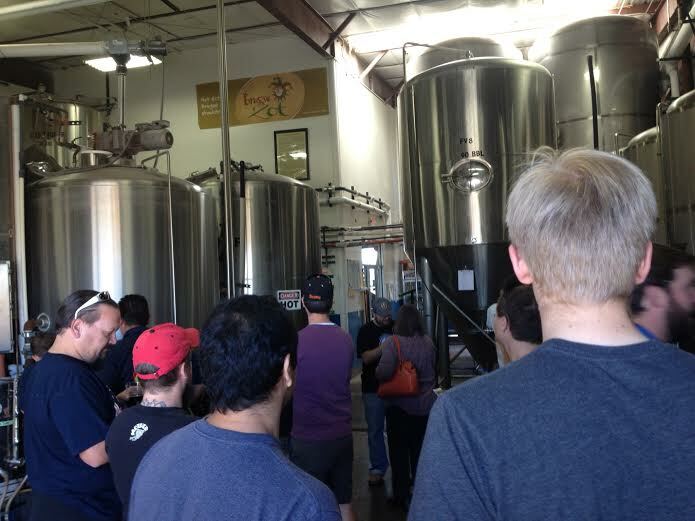 You can take his taproom tour in Santa Fe! DSBC: I will definitely be on that tour! What’s your favorite style to brew? Angie: Made a chocolate porter, definitely my favorite. 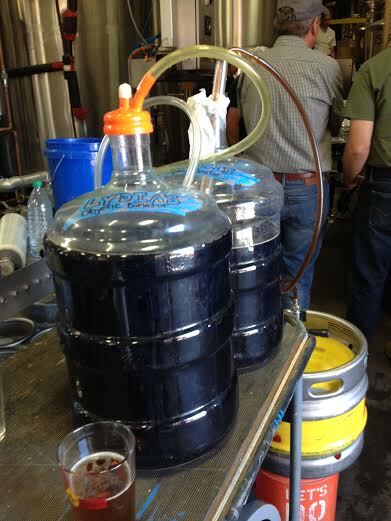 DSBC: Last question, what’s in the fermenter? Angie: A peach saison, for the wort challenge, but hoping to get another batch going soon! DSBC: Great, thanks Angie, and good luck with the challenge! Carboys full of home-brewed beer. DSBC: What’s your name, sir, and where are you from? Scott: Scott Carpenter of the Dukes of Ale, from Albuquerque, NM. DSBC: How long have you been homebrewing, Scott? Scott: My wife bought me a session for Valentine’s Day, there at Kellys Brew Pub. A friend and I did a batch there, and we had all these empty bottles laying around, so she brought me a starter kit. So I started doing my own, and that’s what kicked it off. And now I’ve done 37 batches in the last five years. DSBC: Wow! Excellent. What are your favorite styles to brew? Scott: Anything experimental. I’ve done a sage gruit with bread yeast, instead of brewer’s yeast, and that actually won some medals. But other than that, I like a chicory stout. I used oak chips that I had soaked in Wild Turkey bourbon and chicory coffee and made an awesome stout. Right up your guys’ alley, the Dark Side Brew Crew. DSBC: Oh yeah, we’d be all over that one. One more question. What’s in the fermenter? DSBC: Oh yeah, how do you feel about that one? Scott: Well, four gallons, I’m excited. But I’ve got a bunch of Maris Otter so I may do something else to it. As always, I kid, but I’ve seen it before. Anyway, thank you to everyone who came out for the event, doing your part to make the beer community stronger, blurring those lines between pro and amateur, newbie and vet, certified judge and chug-a-lugger. And special thanks to those of you who spent a minute or two just talking beer with the new guy. Much appreciated! Happy Friday everyone. Stoutmeister here with a grab-bag of beer news and notes. I would ask if you all had a fun Halloween, but it seemed strangely quiet out there. Save for a show at Sister Bar and the kids trick-or-treating, putting the great holiday on a Thursday meant a lot of folks put it off till Saturday. Or at least it did for us in the Crew. We were not a festive bunch, but we will try to make up for it this weekend. Anyway, there are some beer-related goings-on this weekend and a recap of stuff from last weekend. Las Cruces gets its own fall beer festival. Rejoice, southerners! Las Cruces usually has little to celebrate on Saturdays, what with the New Mexico State football team being just about the worst program in America. So for a second time this year, the NM Brewers Guild is doing something about that with another beer festival. The Dia de la Cerveza will take place in downtown Cruces on Saturday from noon to 4 p.m. There are 11 breweries signed up and you can still get tickets online for just $15. There will also be food trucks and live music present. So what breweries will be in attendance? Of course High Desert will be there, plus Deming’s Mimbres Valley, which has a taproom across the street from NMSU now. Others on hand will include Little Toad Creek, from the mountains near Silver City, and a full-on northern invasion featuring Abbey Brewing, Blue Corn, Bosque, La Cumbre, Marble, Santa Fe, Second Street, and Sierra Blanca/Rio Grande. None of the Crew can make it down, but if anyone wants to share pictures or write a guest post review, contact us at nmdarksidebrewcrew@gmail.com, or via our Facebook page. The mad scientists at Il Vicino have created a beer called Day of the Dead. It’s a Belgian Dark Strong aged in bourbon barrels. This beer won’t just put hair on your chest, it will probably turn you into a Sasquatch. It debuts today at the Canteen, so keep an eye out for the Crew. We’ll almost certainly stop by to try some of this monstrosity, which should be well over 10-percent ABV. Meanwhile, if you have a hops craving, head over to La Cumbre for some of their “Chinookered” IPA on cask. Head over quickly, since last week’s batch only lasted a few hours. Up in Santa Fe, there will also be a firkin present at Second Street’s original location as their Cask and Curry series returns for 2013, starting today. The voting totals are in for the best of fest, plus the best of the home brews. For the latter, the Dukes of Ale were happy to pass along (via the always awesome Marne Gaston) that Brian Ausderau’s Green Chile Pumpkin Beer won the people’s vote as the best of the five home brews offered up at their booth in the southeast corner of Hopfest’s main room. Both Brandon and Derek greatly enjoyed this unique take on a pumpkin beer. Ben Miller’s IPA was a very close second, which should come as no surprise since A) this state loves IPAs, and B) Ben is a former winner of the Samuel Adams Longshot Competition. The man can brew, people. Anyway, Hopfest also released the people’s choice for Best of Fest, which went to a full brewery rather than a specific beer (because we all know that was Uinta’s Labyrinth). The people’s choice for the fourth straight year was Marble. No wonder Ted was smiling all day. Checking in at a very close second was New Mexico Craft Brewing, whose Wet-n-Wild IPA was one of the biggest hits at Hopfest. Il Vicino and Tractor came in third and fourth, so it was very nice to see that people continue to vote and support local breweries first and foremost. Since I guess some folks needed a break from beer, Angry Orchard was fifth. There was a three-way tie for sixth between Alaskan, Dukes of Ale, and Woodchuck. This mad love for cider is … unexpected. Kona, Santa Fe, and Uinta tied for seventh. Eel River and Indian Wells tied for eighth. Ninth was a five-way tie between heavyweights Abita, Anderson Valley, Clown Shoes, Left Hand, and Odell. Kellys, Red Hook, and Widmer Bros. all tied for 10th place. We can’t complain too much about those selections, as we enjoyed at least one beer from each of those breweries (leaving out the two cider joints, of course; it’s a beer festival, we drink beer). Anyway, that’s it from a surprisingly newsy Friday. If there is ever some breaking beer news that slips past us, please contact us at the email we listed above or Facebook or Twitter (@nmdarksidebc) or just leave a message here. And if you see us at a brewery, you can tell us there, too. See some of you around the breweries this weekend. And a happy birthday on Saturday to Broken Bottle’s Chris Chavez!